If you want to join the testers team just open a support ticket here and we will add you to the list. You will always get the newest features first. Please note that you must be among existing users of wpDataTables. For the people who want to request support: please make sure that you check the FAQ, documentation first. If your question isn’t there feel free to contact our support manager through the support system. We receive a lot of requests nowadays, so we ask you for understanding in case of delayed replies. Delete the old wpDataTables version folder. 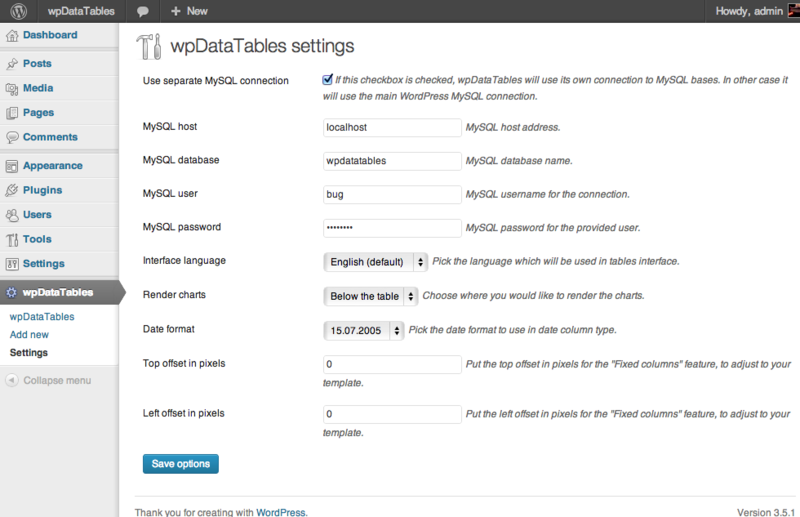 Upload the new version of wpDataTables. Deactivate wpDataTables, and then activate it again. A minor release with a couple of improvements. A major release with a couple of new features and stability improvements. Feature: Number range slider – now it is possible to use the number range slider for filtering float and integers columns. Feature: Google Stacked Bar chart. Feature: Possible values in edit modal for the foreign key column – Added checkbox option where you will be able to choose possible values for the current user or all possible values from a foreign key table. BugFix: Foreign key for non-server side Gravity tables enabled. BugFix: Fixed issue with applying font and color settings in the new skin. Compatibility with WordPress 5.1 confirmed. Please note: If you update the wpDataTables to version 2.5, please update the Gravity Forms Integration addon to the latest version as well. Feature: On/Off advanced filtering, sorting and editing option in the column list. Feature: New date format Y.m.d in Date format options. BugFix: Problem with integers in Scatter plot chart Highcharts resolved. A minor update with a couple of features, bug fixes and stability improvements. BugFix: Filtering trough URL for the first column. Please note: as of 2.3 version, the minimum required PHP version is 5.6! BugFix: Minimum PHP version check – plugin will show a warning and won’t activate if you’re running an outdated PHP version. A major update with a new feature, bug fixes and stability improvements. Feature: Separate database connections for MS SQL and PostgreSQL databases, and an option to add more than one separate database connection. Now every table can have its own separate database connection, so tables can pull data from multiple databases and servers. A regular update with a couple of new features, bug fixes and stability improvements. An option to choose CSV delimiter in the Settings page. A regular update including some stability improvements and bugfixes. A minor stability update including some patches for auto-update feature. A significant update with a couple of new features, stability improvements, and other. Compatibility with WordPress 4.9.5 approved. Compatibility with WordPress 4.9 approved. A minor update mostly with stability improvements. Feature: Checkbox for including Bootstrap on the front-end added on the Settings page – now if there is a JS conflict in Bootstrap files with your theme it can be resolved by disabling the checkbox. Bugfix: Duplicating the table where “Users see and edit only own data” feature is enabled – now the tables can be duplcated properly. Compatibility with WordPress 4.8.1 approved. Sorted possible values – possible values are now sorted alphabetically when read dynamically from the data source. Compatibility with WP 4.8 confirmed. Compatibility with WP 4.7.3 confirmed. Chart.js - Now wpDataTables plugin has third chart rendering engine. Beside Google Charts and Highcharts we have added Chart.js that renders simple and flexible charts with a lot customization options. Chart live preview - In wpDataTables Chart Wizard now there is no Preview step anymore. Chart changes are instantly visible and shown on the chart that is rendered in the right side of the screen. Support for NULL/empty values - Now when editing editable wpDataTable it is possible to leave a blank cell for integer and float columns. Fix for Formula columns - In version 1.7 if some of the columns contained number in column original header then formula column didn’t work. Fix for Conditional formatting and Responsive mode - When table was in responsive mode show on mobile phone conditional formatting didn’t work. Fix for Datepicker layering - Datepicker was appearing behind edit modal on some themes in previous versions. Excel-like table editing – Now tables can be shown and edited not only with DataTables library, but also with Handsontable library, which has a nice Excel-like interface which supports bulk selection, drag’n’fill, duplicate, bulk delete, convenient inline editing, and many other features. Read more here. Lots of improvements for charts – more formatting and styling options for both engines, group feature. Read more in the blogpost, check the video part showing the new features. DateTime and Time column types – proper displaying of DateTime and Time (till minutes till now), as well as editing, sorting, filtering, etc. See the blogpost for more details. Import Google Spreadsheets to WP database with Table Constructor – see the blogpost for more details, or see this video part showing the feature. Settings on Settings page divided into tabs. See quick video overview. Table duplicating for manually created tables now allows duplicating the data source as well. See quick video overview. Other minor stability improvements and bugfixes. See more information in the full blogpost. Fixes for chart editing - selected Google chart type and the follow table filtering option didn’t persist correctly on editing, now this works fine. Inline editing – you can edit the content in editable tables directly from the cells now. Click here to see the docs, or here for video demo. Conditional formatting – it is possible to highlight rows, cells, columns, or change CSS classes. Click here to see the docs, or here for video demo. Formula (calculated) columns – you can add columns in the table that will be calculated based on other columns values. Click here to see the docs, or here to see video demo. Sum (totals) row – you can show totals for numeric columns in the table footer now. Click here to see the docs, or here to see video demo. Auto-read possible values for column - if the table has server-side processing enabled you don’t need to type in possible values manually any more. See video demo. Realtime auto-refresh for tables and charts – Tables which have server-side processing enabled can auto-reload in front-end with defined interval. See video demo. No-flash Table Tools, and advanced configuration for Table Tools – the export functionality is now Flash-independent, works on HTML5, also you can define from the admin panel which buttons to show or hide per each table. See video demo. Global search via URL. You can add a special key in the page URL, and your table will get pre-filtered on load. Click here to see the docs, or See video demo. Auto-generate thumbs for image columns in editable tables. When you upload a new image, a thumb with a link to full picture will be inserted automatically. Skip thousands separator for integer columns. If your column is an integer, but you don’t want formatting (e.g. for years or product codes), you can disable it. Fixed filter rendered in header. It was looking clumsy before when you chose to render the filter in header, now it is rendered in a separate row. Non-UTF8 names for columns in Table Constructor. This was causing trouble before, but now it’s allowed. A major update. A lot of different changes and improvements. Basically the biggest change to wpDataTables since launch. Check this document for more info on new functions. Just another patch on a long way to Table Constructor module. No new features, just bugfixes. False update notification fixed – in the previous version there was a tiny bug that caused plugin to report that there’s a new version available all the time, also to throw a notice in the update list; this is fixed now. Attachments title not displayed – refactoring in the previous version caused an attachments title (uploaded from front-end editor) not to be displayed; this is fixed now. XML parsing errors – a bug which caused a problem with XML format parsing is fixed; also added a check if XML elements have attributes for correct parsing. Table ID notice in shortcode fixed – in some cases when ID was empty it thrown a notice; it is fixed now. Front-end editor add/edit row selectbox problem – front-end editor dialog selectbox was showing first value as selected by default, but actually nothing was selected. Fixed now. Formatted numbers in range filters did not work. Values more then 1000, or if user entered the value in the same format as in cell caused the filter to crash. Fixed now. Column filter selectbox when shown in header did not show. Minor issue with CSS fixed, dropdowns will show correctly now. Date parsing fixed for CSV. In some cases dates weren’t parsed correctly, works fine now. Custom JS was multiply escaped (‘\\\\’). Now it’s fixed. EU date format sorting issue – when there was an empty cell in a date column with EU-formatted date (dd.mm.yyyy) it crushed sorting; now it’s fixed – empty cells will always be treated as the earliest date possible. Preview with charts fixed. Now you can preview your charts in the backend along with the table, which didn’t work in earlier versions. Even rows color picker didn’t work. Now it’s fixed and you can choose the color of the even rows. Font color picker for table header didn’t work. fixed now. Auto updates – we planned this for 1.6, but since there were already a couple of unplanned releases, we decided not to postpone it any more to make life easier for users. Starting from current version, if you enter your Envato Purchase Code, plugin will tell you when the new version is released, and do the auto update. To prevent piracy, maximum number of downloads of one version per purchase code is 2. But you can always download new versions directly from Envato and install in the good old-fashioned manual way. File-based tables speedup – for large tables based on files you should have a significant improvement in speed now. Number range filter issue fixed. There was an issue in version 1.5.3 that broke number range filtering because of number formatting, for non server-side processing tables. Fixed now. utf8_general_ci collation added to wpDataTables created tables. Chinese, Japanese, Vietnamese and other UTF-8 characters in column names shouldn’t be a problem any more. “Clear filters” problem solved. Before when users clicked on “Clear filters” some dropdown values weren’t refreshed. Default value dropdown problem solved. Previously if you defined a default value for a dropdown selectbox it didn’t work, fixed now. For more info on what’s new and complete changelog you can see this page. Update procedure: Disable plugin, overwrite with files from the new package, enable plugin again. This is necessary since the database structure has to be updated on reactivation. 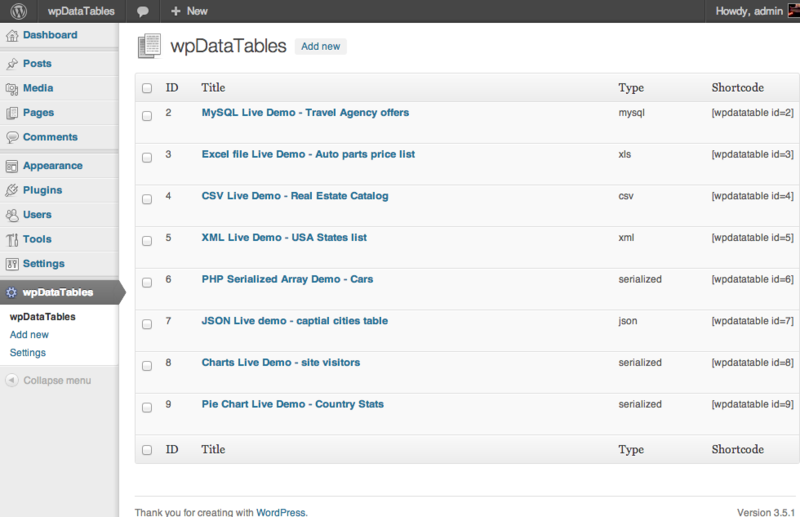 wpDataTables 1.6 is a mighty data manager in a form of a WordPress plugin. It helps you to create dynamic responsive tables, charts in your WordPress site edit and allow your front-end users to edit data in them. See the video features overview or the text features overview if you’re interested. Cute interactive multi-functional front-end jQuery tables with filtering, sorting and pagination features rendered by DataTables library. 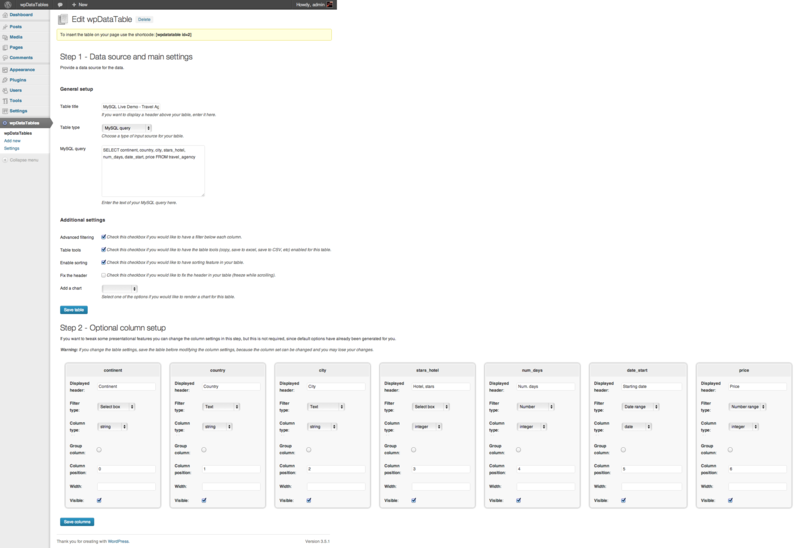 You can manipulate all features easily from the WordPress administrator panel. Server-side processing for MySQL-based tables. same dataset as your table. Charts can be updated in realtime together with the table, as you filter the data set. Front-end editing for MySQL-based tables. Table constructor which allows to create the tables from back-end. MySQL query generator. Builds all the “SELECT FROM, JOIN, WHERE, GROUP” for you – just click the correct buttons! Responsive mode for any tables. Advanced front-end table features: print view, save to PDF, save to CSV, save to Excel, Copy to clipboard by TableTools extensions. Row grouping based on RowGrouping extension. If a lot of rows have same values of some column you can group them based on the value of this column. The sorting will be performed inside of these groups. Accepted data sources: PHP serialized arrays, Google Spreadsheets, MySQL queries, MS Excel XLS and XLSX, OpenOffice Calc ODT, CSV files, JSON objects, XML data source. Tweakable columns with different column types – strings, integers, floats, links, dates, images. There’s a video course of around 40 short tutorials filmed on wpDataTable. Check it out on our site! Check out the documentation and live examples before you purchase on our demo site.